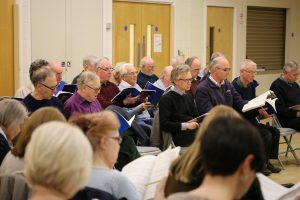 We welcome enquiries from new singers irrespective of experience and are always delighted to hear from anyone who would be interested in singing with us, or in just finding out more about the Choir. We usually meet for one evening rehearsal each week in term time, and sometimes an additional daytime rehearsal at the weekend, as well as a final rehearsal on the day of a concert. We do not currently audition prospective members. The current 2018/19 subscription rate is £135, payable in September, or as two £70 instalments payable in September and January. A reduced rate of £25 applies for younger members under the age of 25, and, at the discretion of the treasurer, to members who would otherwise not be able to afford to take part. For information about joining the choir or if you have other questions, please contact the Membership Secretary.